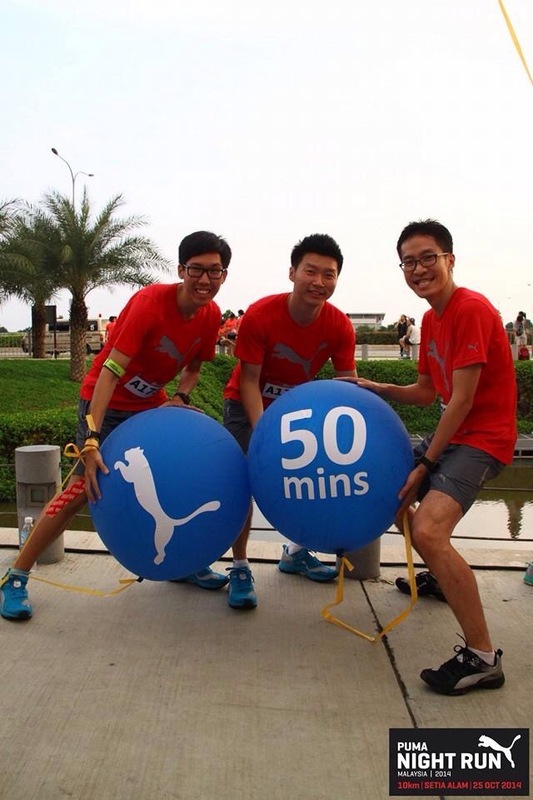 The Puma Running Club has a special place in my heart. It was where my running journey really began. It was a society where I felt that I was cared for, loved and wanted. From being a member, to a pacer and now, one of the leaders of the club, all I can say is that this group is SOLID. 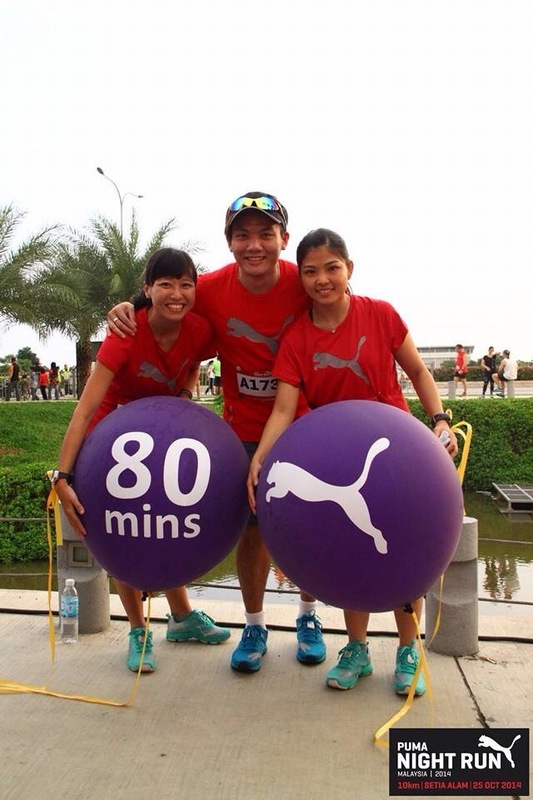 With the Puma Running Club, many of us achieved our running goals and PBs. Together (both the pacers and our running club members), we grew in our running abilities and our love for the sport. 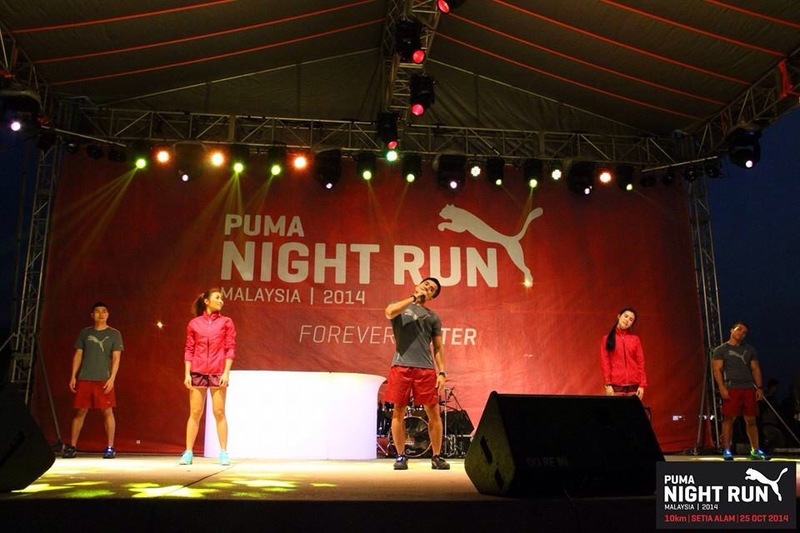 The Puma Night Run 2014 was the first ever of its worldwide series in Malaysia. This was the club’s major highlight event. It was where we could showcase what we have been doing every week, pacing our members and helping them reach their goals. We also had a 10KM program that was tailored for this event. The months and weeks leading up to the big day were stressful for us. Although we were not part of the organizing team, we felt responsible for anything that could possibly ruin the whole event. We highlighted every single detail to the organizers and made sure that they met our needs. Stuff like the route being under distance was out of our control as we couldn’t get pass the authorities. All we hoped for was a killer event for the runners! I was down with fever on the morning of the big day (of all the days to fall sick, it had to be on this day!). I was thinking of giving the event a miss but I knew that I HAD to be there. I had 2 panadols before making my way to Setia Alam. Upon arrival, I was impressed with the Village Area. It was like a mini Puma carnival with large canopies, a stage and many miscellaneous stalls around. Honestly, this event exceeded my expectations. Judging from what we had to deal with the few weeks leading up to this event, I wasn’t expecting this. We gathered at the Convention Centre for a briefing session and also to get our pacer balloons. LED BALLOONS! How cool is that? We had some time to catch up with each other, take photos and walk around the Village Area before gathering backstage. The whole atmosphere was just really chilled and relaxed. I felt really good! For once, I will be pacing the runners instead of competing with them. After the short warm up session by our celebrity guests, it was our turn to go on stage. They introduced the pacers. Our 1 minute of fame? I was the 60 minute pacer, along with Yung Hui and Felix. As I don’t own a GPS watch, I had to rely on them to make sure that we were getting our paces correct. We stayed within 5:45 to 5:55, with a few minutes of buffer. It was an enjoyable run. The route was pretty much flat with one small hill (element of challenge?). There were many U-turns which I thought was great! I love U-turns because you get to see the other runners on the opposite side of the road. I cheered for all the top runners when I saw them running pass. SO EXCITING! And of course, seeing the other pacers and runners go by was also very exhilarating. I felt so good that I had forgotten that I was sick. Running is the cure! I was surprised to see water stations at every 3KM (total of 3 water stations). I don’t normally drink for 10KM races but you would usually find 2 water stations. So, thumbs up for 3 water stations! I would have preferred if they had placed the last water station at the finish line. Also, traffic control was a bit poor. During the final KM, I had a few cars getting in my way. As a pacer, I am glad that I was able to help motivate and push some of the runners to the finish line. Some of them managed to hit their Personal Best! Way to go! When the runners thank you personally at the finish line or through social media (Facebook, Instagram, twitter etc), you know that all your hard work has paid off. It is so rewarding. Their faces and their expressions – Priceless! I feel so happy for them! When you are dedicated enough, you will find a way. Before the big day, all of the pacers met up during the Deepavali Holiday to test the route. Although it was a Public Holiday, everyone made it for the trial run. I want to take this opportunity to thank all of our guest pacers: Zi Shen, Hui Xin, Lucas, Yuki, Michael, Xiao Jin and Seven. Thanks for helping us out! And of course, our core pacers: Victor, Elaine, Daniel, Shu Wei, Yung Hui, Felix, Peng Peng and Brian. Special thanks to Zi Shen and Victor who made many other small arrangements and making sure everyone did their best. As pacers, we NAILED our timings and I am so proud of them. After our run, we went to look for the sweepers. We ran/walked all the way back to the finish line together. No one was left behind. 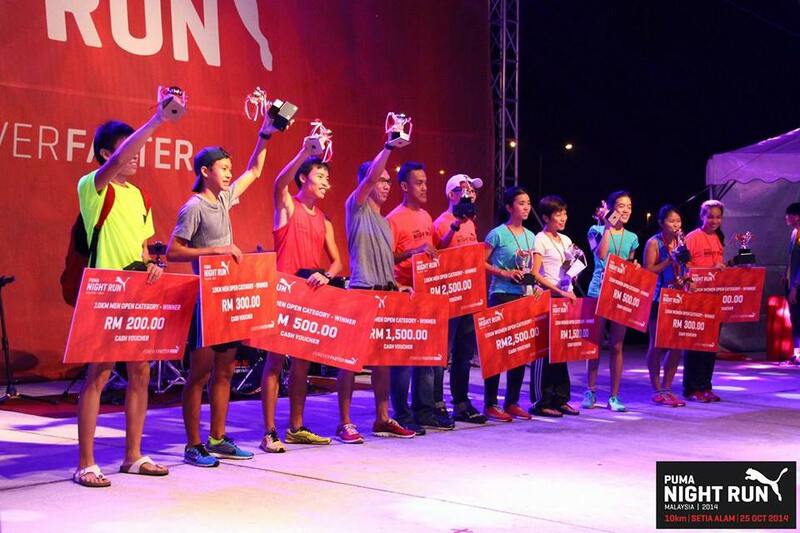 The Puma Night Run 2014 winners! Congrats! Psssst, 3 of them are our running club members! The night ended with fireworks! SUPER! All in all, I think it was a pretty good event! The pacers had loads of fun at the after party concert! You should have seen some of them. Everyone was out of their “running element”. 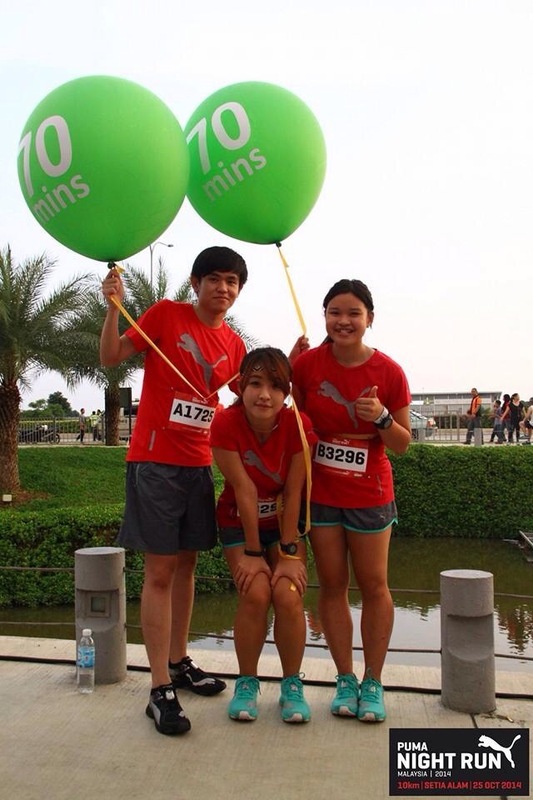 Errrrr…presenting…our fastest runner. We received quite a number of feedback from the runners, both good and bad. Thank you for all of them! No event is perfect, the organizers are humans as well and sometimes, we make mistakes. 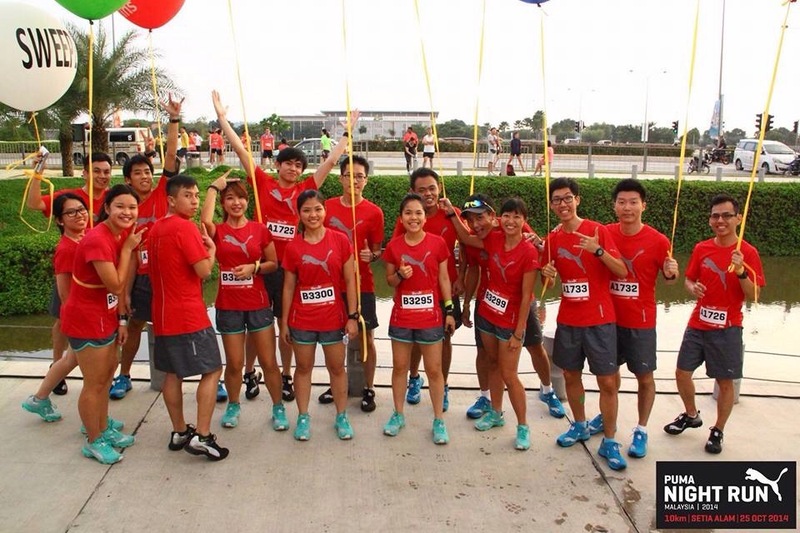 On behalf of Puma Malaysia and the organizing committee, we apologize for any mishaps that occurred along the way. We value all of your comments and we will forward them to Puma Malaysia. 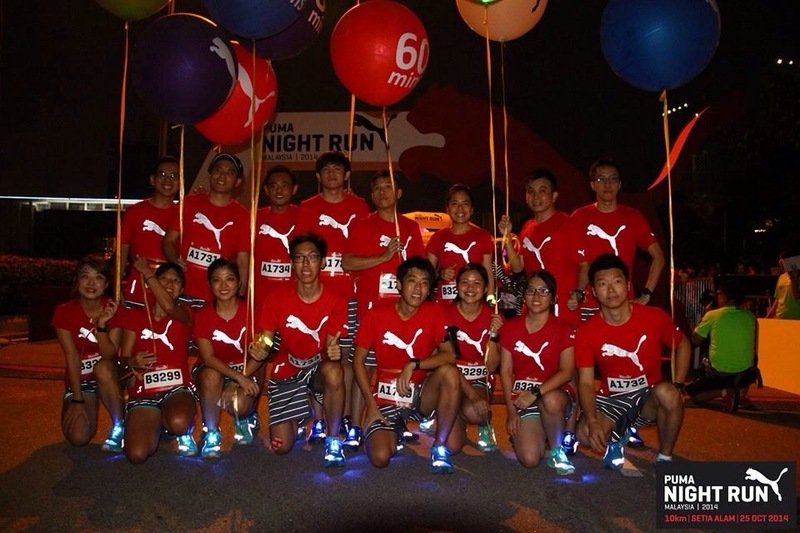 We hope that the Puma Night Run 2015 will be even bigger and better! Thank you for all of your support! It means the world to us! Oh and ummm, post run fuel with the Puma gang. We came and we conquered! GOOD JOB GUYS! At the end of the day, it all boils down to our love for running. We are all in this together. We are here because we share the same passion. Let us encourage and empower each other, instead of bringing each other down! Spread the love people! Love you guys! Thanks for making it an awesome one! 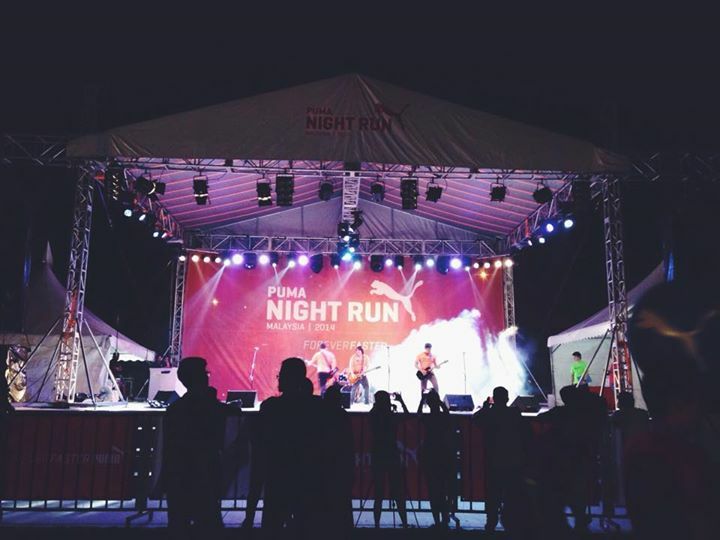 See you at the Puma Night Run 2015! It’s was awesome run!! I manage to finish the run below 1hour30min. You guys ar way to fast. Now, I can’t feel my leg anymore, super pain & hard to walk. Anyway, see you guys in some other event. Route was not lit well as several parts…and water station/water should be provided near to the finish line. 3 water stations was just right..only water at finish line (again!) is my comment. Think more focus should be on the run instead of the entertainment. Water could also be provided before the start of the event. It was a joke having a drink stall directly behind the water/100 plus booth selling drinks before the run but no water was provided for runners. Medics should be ready even at finish line. I knew of one runner who was coughing badly and needed assistance but not officials/medics were around. Fellow runners and drinks vendor helped him. The balloons are fun but ended up littering the street…and was also a hazard to runners. Runners should learn how to throw rubbish properly…too much litter along the road after every water station. Good first attempt but lots of improvement can be made for future. Hi Ling, thanks for your comment. I’ve personally received plenty of positive feedback about the race, and had a good experience myself but I agree with you on certain points like there not being a water station at the end and not enough emphasis on runner safety (medical aid at finishing line and certain parts being dark). The littering after the water station happens at every race, I’m not sure if there’s anything that can be done as runners are too focused on running to look for bins. I’m sure the organisers cleaned up the balloons and litter after the event. 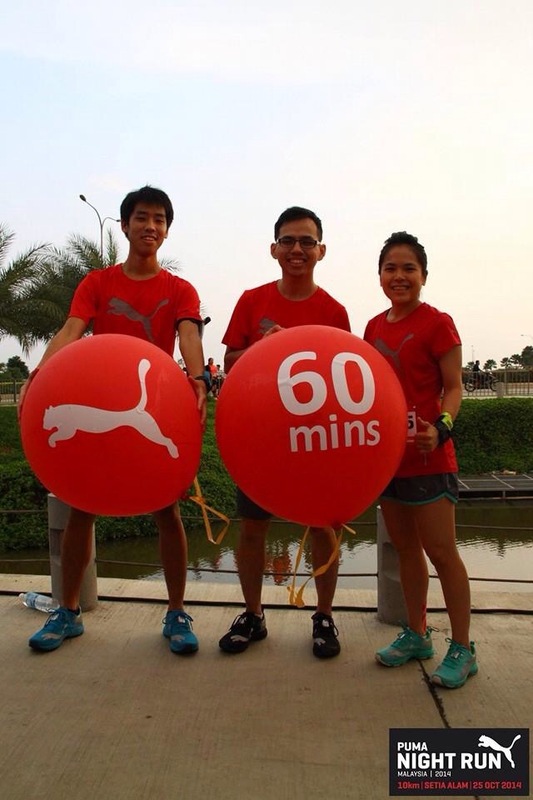 Anyway, thanks again for the feedback – I’ll forward it to Puma Malaysia (and the event organisers). Hope to see you again next year! Agree with Ling above on the quality of the race and overall event organization. Here is my helpful criticism, I hope it will help improve furthermore to be the best in the future. Agree certain parts too dark. It will be good if the night race is started earlier so that there is more light for the runners to see. Please follow the example of other races in Malaysia – there is a reason why so few races are held at night. Because it is DARK! If organizers realize that it is dark because it is night time, they should provide headlamps like Energizer night run. I too feel the balloons were a dangerous hazard to runners. I nearly jump out of my skin when a few burst beside me (I was trying to avoid them, but the runners beside me just stepped on them making them burst with a loud noise BANG). The “village” is too commerscial – running is about healthy and lifestyle, not DJ and beatbox performance. The speakers were too loud and damage my hearing (this is why I choose not to go clubbing. Also more time to train seriously). The grass was a bit muddy and wet in some places, organizer should make it dry or organise when it is not raining earlier. Fireworks is waste of money and also a bit scary. Also isn’t fireworks banned in Malaysia? The bendy wall is nothing to do with running at all, I find it ridiculous to have such thing at running event. It is not a carnival. Agree again that runners should be more clean conscious, every race I run in the runners throw the cups all over the road even though the bins are provided. This must be improve for the sake of running. There are too many pacers for a 9.7K race (my GPS watch told me this, it IS NOT 10K AS STATED), I was confused which one to follow and end up I faster than all of them, although I didn’t manage to podium. Maybe next year. Yes, I agree with most part especially the DJ one. I don’t like DJ and beatbox performance. They should hire orchestra and play classical music or maybe Kenny G, I like Kenny G, the best! I do not agree with you on the speakers part. You could actually stand far away. If you stood inside the Setia City Mall, it’s actually OK, you won’t feel too loud. I afraid runners might not enjoy it, since most of the runners are youngster. In my view, play music is enough, no need those performer la. Spend those money on runners better, more water station, more goodies for example. I dunno y malaysia event u hire b-box show, that is guai Lou thing, u shud hire Siti Norhalisa or Guang liang to perform ma. btw I like the run, coz I like to run in night time coz I always train after Fong gong. So the time suitable for me. I agree with above Lam comments, is too much pacer for 10km race, I never saw a 10km race got pacer de.I like the lady pacer for 60mins..(I think is u) but I cannot run too fast….so I can only follow 80minutes pacer as I am slow runner. Can u next time be 80minutes pacer if got puma race on next time? Water station ok ok lo, saw ma drink lo, no ma dun drink lo I never mind, 10km I oso can tahan no need drink.but I dun like 100%, I prefer kopi ais, ppl say caffeine can help us run fast. but thanks for this run, coz is my best running time for my 10km.but oni 9.7km….count count xia seem lebih kurang like my normal timing oni.anyways thanks la. Come on, kopi ais is too much! Pfftttt… I asked for 100 plus panas they also don’t have. I prefer hot drink. Walao….whr got ppl drink hot 100+ de? Oni sick ppl do if he demam. If u demam den dun come run la. kopi over meh? Kopi is famous drink in Malaysia, organizers shud put more Malaysian culture in the activities, so that we can promote our country. U see Japan run they give grape while u running becoz the grape is the product of the area they organized the race. The balloons made me so nervous before the race. Please be considerate for those who are terrified of balloons. You know, balloons are so scary when they pop! pop! pop! The sounds were too loud and I swear it was the most horrible experience I had ever. The performances during that night was unnecessary – too loud and not suitable for old auntie like me ya hehe. Please learn from SCKLM (or even BOSTON marathon) on how to organise a race. 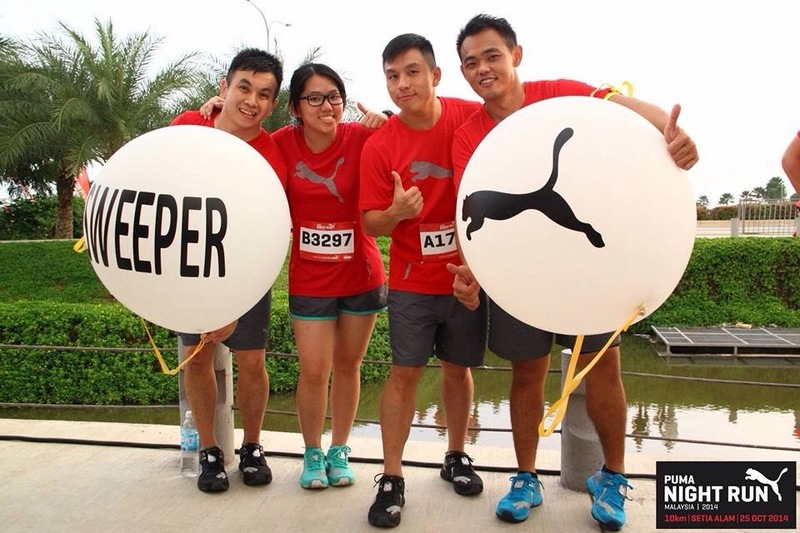 OHH YAAAA, PUMA should consider to give out free drinks before the race. 100+, gatorade or even coffee are acceptable. You know lah….not every runners bring their own water to the race site like me. This was one of the best runs I would say, and definitely the best goodies bag! Overall I was very much satisfied, and hopefully this will be held in Setia City Park next time as well.